I probably don’t say this enough, but thank you for visiting and reading this blog. I appreciate that you dedicate your time to come here for information. As you’ve likely seen on Twitter and other internet-based places, the Southern California News Group is going through some changes and the Inside SoCal blogs will soon be a thing of the past. But don’t fear. While this specific page will soon become inactive, all the same content will be available here going forward. The new page will still have all the stuff we did here (video interviews, GIFs, football Q&As, graphs, analysis) but will also include links to full stories and notebooks. You can still comment on stories using the same Disqus platform. One-stop shopping for all your UCLA needs. If you have any questions, you can still find me on Twitter or shoot me an email at thnguyen(at)scng(dot)com. UCLA added a verbal commitment from tight end Matt Alaimo on Wednesday, pushing its 2018 recruiting class to 19 total recruits with one week left before National Signing Day on Feb. 7. The 6-foot-5, 235-pound three-star prospect was also considering offers from Texas A&M and Auburn. He briefly lent his verbal commitment to Pitt in December, but backed off on Dec. 21. He was recruited by in-state Rutgers as a dual-sport athlete, according to NJ.com, as he is also a star first baseman for St. Joseph Regional High. Alaimo is the only tight end Chip Kelly has for this class so far, but adds another weapon on offense for the Bruins, who signed a trio of four-star receivers last month and have commitments from two more three-star receivers. The group is ranked 18th in the country according to 247 Sports’ Composite Rankings and fourth in the Pac-12. 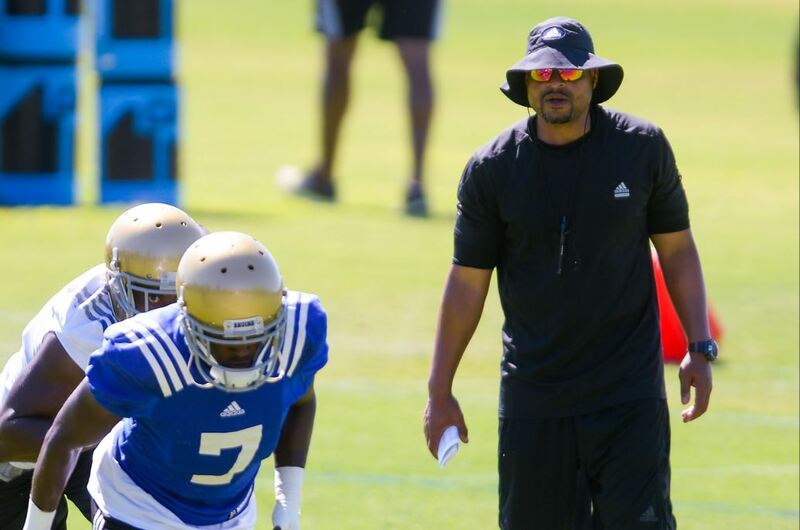 Former UCLA defensive backs coach Demetrice Martin made his new job Twitter official on Tuesday, changing his Twitter avatar to a photo of Arizona’s block A and adding Arizona’s #BearDown slogan to his biography. The move was reported last week by the Arizona Daily Star. Arizona head coach Kevin Sumlin, who took the job after being fired from Texas A&M, has yet to officially announce his full coaching staff. (Update 3:25 p.m.) Here’s the final coaching staff. Martin will be coaching cornerbacks for the Wildcats and will coach with former UCLA offensive coordinator Noel Mazzone and former UCLA quarterbacks coach Taylor Mazzone. Martin will be coaching at his fourth Pac-12 school having already previously worked at Washington and USC. He was a noted recruiter for the Bruins while coaching defensive backs for the past six seasons but not retained by Chip Kelly. The Pasadena native was well-liked by players and roped in one of the top defensive backs classes in the country last year with five-star cornerback Darnay Holmes and four-star prospect Elijah Gates. Martin will return to the Rose Bowl on Oct. 20 with the Wildcats. Senior guard Jordin Canada earned her second Pac-12 Player of the Week honor this season after helping No. 9 UCLA to a road sweep of Washington and Washington State last weekend, the conference announced Monday. Canada averaged 20.5 points per game during the sweep with eight total assists, five blocks and four steals. With 303 career steals, Canada, the defending Pac-12 defensive player of the year, is just the fifth player in conference history with more than 300 steals. The Bruins (17-4, 8-2 Pac-12) held Washington without a field goal in the fourth quarter on Friday in Seattle to pull away late and win 86-69. Canada scored 15 of her team-high 22 points in the second half to help UCLA come back from a three-point halftime deficit. 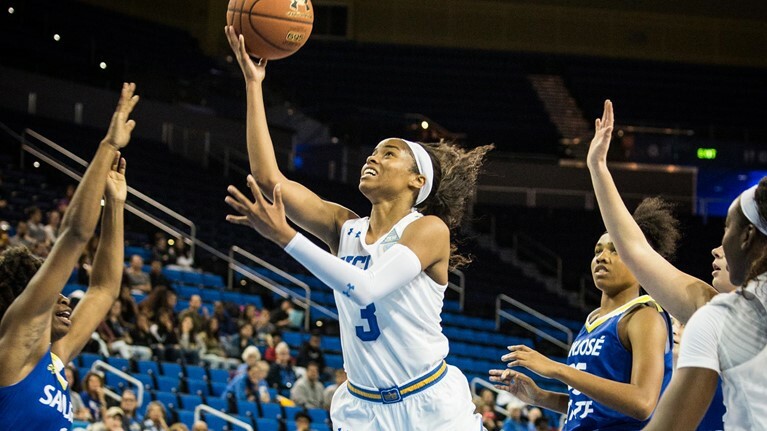 The point guard from Windward High led the Bruins with 19 points against Washington State on Sunday to complete the road sweep with a 79-71 victory in Pullman. Monique Billings had 15 points and 15 rebounds. Lajahna Drummer added another double-double with 10 points and 14 rebounds. With a six-game winning streak, the Bruins are second in the Pac-12 behind Oregon (20-3, 9-1 Pac-12) and host rival USC on Friday at 8 p.m.